The intrinsic value of a business (or any investment security) is the present value of all expected future cash flowsStatement of Cash FlowsThe Statement of Cash Flows is one of the 3 key financial statements that reports the cash generated and spent during a specific time period, it acts as a bridge between the income statement and balance sheet, discounted at the appropriate discount rate. Unlike relative forms of valuation that look at comparable companiesComparable Company AnalysisHow to perform Comparable Company Analysis. This guide shows you step-by-step how to build comparable company analysis ("Comps"), includes a free template and many examples. Comps is a relative valuation methodology that looks at ratios of similar public companies and uses them to derive the value of another business, intrinsic valuation looks only at the inherent value of a business on its own. Benjamin Graham and Warrant Buffet are widely considered the forefathers of value investing, which is based on the intrinsic valuation method. Graham’s book, The Intelligent Investor, laid the groundwork for Warren Buffett and the entire school of thought on the topic. The term intrinsic means the essential nature of a something. Synonyms include innate, inherent, native, natural, deep-rooted, etc. There are different variations of the intrinsic value formula but the most “standard” approach is similar to the net present valueNet Present Value (NPV)Net Present Value (NPV) is the value of all future cash flows (positive and negative) over the entire life of an investment discounted to the present. NPV analysis is a form of intrinsic valuation and is used extensively across finance and accounting for determining the value of a business, investment security, formula. Variations include multi-stage growth models and assigning a probability or level of certainty to the cash flows and playing around with the discount rate. The task of risk adjusting the cash flows is very subjective and a combination of both art and science. In the discount rate approach, a financial analyst will typically use a company’s weighted average cost of capital (WACC)WACCWACC is a firm’s Weighted Average Cost of Capital and represents its blended cost of capital including equity and debt. The WACC formula is = (E/V x Re) + ((D/V x Rd) x (1-T)). This guide will provide an overview of what it is, why its used, how to calculate it, and also provides a downloadable WACC calculator. The formula for WACC includes the risk-free rate (usually a government bond yield) plus a premium based on the volatility of the stock multiplied by an equity risk premium. Learn all about the WACC formula hereWACCWACC is a firm’s Weighted Average Cost of Capital and represents its blended cost of capital including equity and debt. The WACC formula is = (E/V x Re) + ((D/V x Rd) x (1-T)). This guide will provide an overview of what it is, why its used, how to calculate it, and also provides a downloadable WACC calculator. The rationale behind this approach is that if a stock is more volatile, it’s a riskier investment. Therefore, a higher discount rate is used, which has the effect of reducing the value of cash flow that would be received further in the future (because of the greater uncertainty). A certainty factor, or probability, can be assigned to each individual cash flow or multiplied against the entire net present value (NPV)Net Present Value (NPV)Net Present Value (NPV) is the value of all future cash flows (positive and negative) over the entire life of an investment discounted to the present. NPV analysis is a form of intrinsic valuation and is used extensively across finance and accounting for determining the value of a business, investment security, of the business as a means of discounting the investment. In this approach, only the risk-free rate is used as the discount rate, since the cash flows are already risk adjusted. For example, the cash flow from a US Treasury note comes with a 100% certainty attached to it, so the discount rate is equal to yield, say 2.5% in this example. Compare that to the cash flow from a very high-growth and high-risk technology company. A 50% probability factor is assigned to the cash flow from the tech company and the same 2.5% discount rate is used. At the end of the day, both methods are attempting to do the same thing – to discount an investment based on the level of risk inherent in it. Below we will provide examples of how to calculate the intrinsic value in Excel using the two methods described above. In the screenshot below, you can see how this approach is taken in Excel. The risk-adjusted discount rate for this investment is determined to be 10.0% based on its historic price volatility. In this method, there is no certainty or probability factor assigned to each cash flowValuationFree valuation guides to learn the most important concepts at your own pace. These articles will teach you business valuation best practices and how to value a company using comparable company analysis, discounted cash flow (DCF) modeling, and precedent transactions, as used in investment banking, equity research,, since the discount rate does all the risk adjusting. As you will see, for an investment that pays $10,000 at the end of each year for 10 years with a 10% discount rate, the intrinsic value is $61,446. To learn more about DCF models, check out CFI’s online financial modeling courses. As you can see, for this same investment that pays $10,000 at the end of each year for 10 years with a 70% confidence factor and 2.5% discount rate, the intrinsic value is $61,446 (the same as method #1). The trouble with calculating intrinsic value is it’s a very subjective exercise. There are so many assumptions that must be made, and the final net present valueNet Present Value (NPV)Net Present Value (NPV) is the value of all future cash flows (positive and negative) over the entire life of an investment discounted to the present. NPV analysis is a form of intrinsic valuation and is used extensively across finance and accounting for determining the value of a business, investment security, is very sensitive to changes in those assumptions. Each of the assumptions in the WACC (betaBeta CoefficientThe Beta coefficient is a measure of sensitivity or correlation of a security or investment portfolio to movements in the overall market. We can derive a statistical measure of risk by comparing the returns of an individual security/portfolio to the returns of the overall market, market risk premiumMarket Risk PremiumThe market risk premium is the additional return an investor will receive (or expects to receive) from holding a risky market portfolio instead of risk-free assets. The market risk premium is part of the Capital Asset Pricing Model (CAPM) which analysts and investors use to calculate the acceptable rate) can be calculated in different ways, while the assumption around a confidence/probability factor is entirely subjective. Essentially, when it comes to predicting the future, it is by definition, uncertain. For this reason, all of the most successful investors in the world can look at the same information about a company and arrive at totally different figures for its intrinsic value. Intrinsic valuation is often used for long-term investment strategies, but there are many other approaches to valuation and investing. Alternatives include technical analysis, relative valuation, and cost approach. Technical analysisTechnical Analysis - A Beginner's GuideTechnical analysis is a form of investment valuation that analyses past prices to predict future price action. Technical analysts believe that the collective actions of all the participants in the market accurately reflect all relevant information, and therefore, continually assign a fair market value to securities. involves looking at charts and evaluating various indicators that may signal a stock is going to go up or down in the short to medium term. Examples including candlestick charts, momentum and moving averages, relative strength, and more. Relative valuation looks at what other investors are willing to pay for a similar investment and assumes that they would pay a comparable price for the company in question. The two most common examples of this are comparable company analysisComparable Company AnalysisHow to perform Comparable Company Analysis. This guide shows you step-by-step how to build comparable company analysis ("Comps"), includes a free template and many examples. Comps is a relative valuation methodology that looks at ratios of similar public companies and uses them to derive the value of another business (“Comps”) and precedent transactions analysisPrecedent Transaction AnalysisPrecedent transaction analysis is a method of company valuation where past M&A transactions are used to value a comparable business today. Commonly referred to as “precedents”, this method of valuation is used to value an entire business as part of a merger/acquisition commonly prepared by analysts (“Precedents”). In the cost approach, an investor looks at what the cost to build or create something would be and assumes that is what it’s worth. They may look at what it cost other to build a similar business, and take into account how costs have changed since then (inflation, deflation, input costs, etc.). 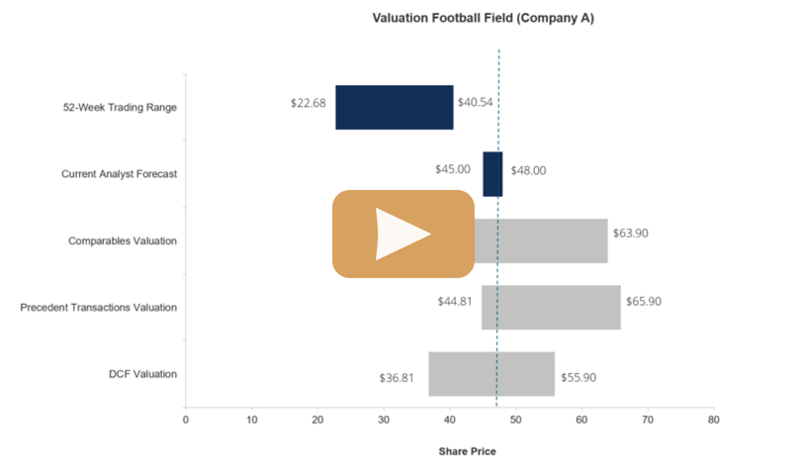 Watch this short video to quickly understand the main concepts covered in this guide, including what intrinsic value is, the formula, how to risk adjust intrinsic value, and how to perform the calculation in Excel. Thank you for reading this guide to intrinsic value. Hopefully, by now, you’ve gained a better understanding of how investors determine what an investment is worth to them.